Kreutz getting ready before a game in 2008. 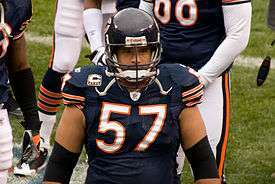 Olin George Kreutz (/ˈkruːts/; born June 9, 1977) is a former American college and professional football player who was a center in the National Football League (NFL) for fourteen seasons. He played college football for University of Washington, and earned consensus All-American honors. He was drafted by the Chicago Bears in the third round of the 1998 NFL Draft and played professionally for the Bears and New Orleans Saints of the NFL. Kreutz was born in Honolulu, Hawaii. He is the youngest of four sons born to Henry Kreutz, Jr., of ʻAina Haina. He attended football powerhouse Saint Louis School in Honolulu, where he lettered in high school football, and was teammates with Dominic Raiola, who was two years behind him, and Chris Fuamatu-Maʻafala. Kreutz also excelled in wrestling and track and field. He received All-State and SuperPrep All-America honors while serving as football team captain during his senior year, and would additionally go on to win the Hawaii state wrestling heavyweight championship. Kreutz attended the University of Washington, where he played for the Washington Huskies football team under coach Jim Lambright. Olin was recognized as a consensus first-team All-American and earned Pac-10 honors during his junior year, after which he elected to turn pro. Olin Kreutz on July 27, 2007 at the Chicago Bears 2007 Training Camp. According to Sports Illustrated, Kreutz was the No. 1 center available in the 1998 NFL Draft. He was described as "a good technician" who "has all the physical tools to be a solid NFL player" while being able to "handle really big NT and DT." The Chicago Bears drafted Kreutz in the third round, 64th overall. He was the highest selected Washington interior lineman since Ed Cunningham in 1992. It was also the second consecutive year in which the Bears selected an offensive lineman from Washington, after Bob Sapp in 1997. Over his twelve-year career, Kreutz has been selected to six Pro Bowls, and was one of the team's most consistent offensive linemen. He started 182 regular-season games for the Bears, second only to Walter Payton. In an incident eerily reminiscent of his college days, Kreutz drew controversy during the 2005 NFL season after breaking the jaw of fellow offensive lineman Fred Miller during an off-practice outing. The NFL fined both players $50,000. On October 2006, Kreutz was signed to a three-year contract extension through the 2010 season. In 2007, Kreutz was appointed as one of the team's captains. In 2011, Kreutz chose to end his career with the Chicago Bears after turning down an offer of $4 million for one year. Kreutz was the longest tenured Bears members at the time he left the organization. On August 5, 2011, Kreutz signed with the New Orleans Saints for a one-year $2 million contract with an additional $2 million in incentives. Kreutz played in four of the Saints' first six games, missing the other two with a knee injury. He then decided to quit the team, saying that he had lost his "passion" for the game; the Saints were reportedly planning to move him to the "left team" list. He was waived after leaving the squad on October 22. On August 19, 2015, Kruetz signed on to be in the WSCR 670 the Score Bears post game show along with James Williams and Hub Arkush replacing the recently deceased Doug Buffone. Kreutz is married to his high school sweetheart, Wendi; they have four children, and reside in Lake Forest, Illinois, but also have a winter home in Kalama Valley, Hawaii. ↑ "Kreutz on Pro-Football-Reference". rbref.com. Retrieved 2007-12-22. ↑ "Kreutz has a 'mean streak' as an anchor on Bears' line". Honolulu Star-Bulletin. October 10, 2001. ↑ Brewer, Jerry (January 13, 2011). "Former Washington star Olin Kreutz reflects on a brilliant career". Seattle Times. ↑ "Bears lose leadership with Kreutz departure". Espn.go.com. 2011-07-30. Retrieved 2016-09-16. ↑ Mike Triplett, "New Orleans Saints center Olin Kreutz decides to leave team", Times-Picayune, October 21, 2011. ↑ John Clayton, "Olin Kreutz not feeling it, leaving Saints", ESPN.com, October 21, 2011. ↑ "Hawaii's Olin Kreutz doesn't seek out the spotlight that continues shining on him". Honolulu Star-Bulletin. February 12, 2005. 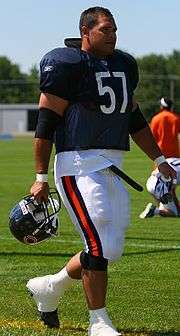 Wikimedia Commons has media related to Olin Kreutz.